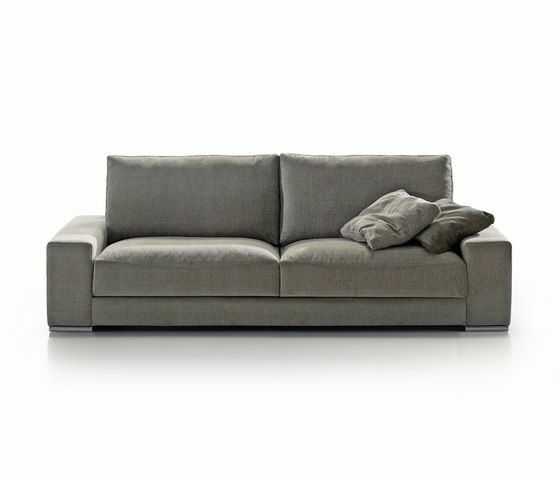 Model where the round shapes of its cushions are enhanced, broad volumes that inspire comfort and meditation. This appearance is achieved using the microfiber down touch padding (Microgel). Wide modularity sofa, allowing all kind of compositions for your home. Modules joined by lateral anchorage. Decorative cushion (47x43cm) for each arm is included. Height measures are with p-25 leg. Steel leg p-23 is 2cm lower. Sofa or module larger than 200 cm are prepared so the arms can be removed. MATERIALS: – Solid wood frame, covered with HR 30kg/m3 foam. Suspension made with Nea elastic webbing, offering quality guarantee of 10 years. – Seat cushion in HR 35kg/m3 foam, with viscoelastic and microfiber stuffing, with interior cotton cover to separate both materials and avoid deformation. – Backrest and cushions made with microfiber down touch padding (Microgel) with interior cotton cover to separate both materials and silicon polyester fiber, with internal divisions in covers to avoid deformation. Cushion upholstery fully removable. – Leg p-23 chromed metal, p-25 and p-42 beech wood. – Finishes: Double seams.